Welcome to day #1 of the Paper Makeup Stamps May Release Review days! 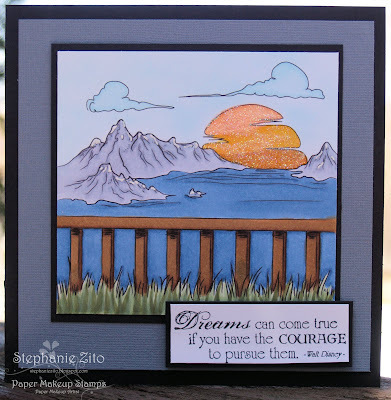 My card today features the new Scenery Background Stamp! This is such a wonderful stamp to colour up and has so many possibilities! Extra products used: Bazzill and Neenah cs, PMS Dreams WordArt, Copic markers, Copic Airbrush System, Memento Ink, white Uniball pen and Glamour Dust. Make sure to stop by the Paper Makeup Stamps blog to see the rest of the reviews from the amazing PMS DT! Fabulous!! I love the lake you created!!! Great sentiment to go with this image too. Lovely card! Great coloring on that scene.